I was so shock when passed by this ck calvin klein boutique in Plaza Indonesia. There is a bundle of long black hair comes out of a painting. I thought the object in the poster is human head, so horror like the infamous Japanese ghost, Sadako, of The Ring movies. 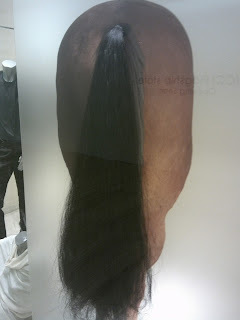 However, a closer and profound observation later told me that it was a picture of a horse but and the hair is the tail. 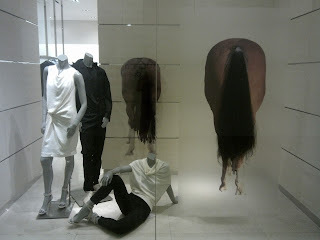 There are two pictures of this horse but only one that has the eerie long hair object.